To continue on with yesterday's story. After going for Pureen Warehouse Sale, we had lunch. 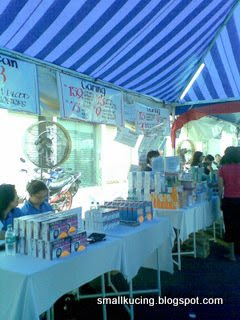 As we were on the way to Caring Pharmacy Warehouse Sale in Old Klang Road, Aunty Siew called Mamarazzi. She informed that there is a massive jam around that area due to Road Block by the Police. When we arrive there, we saw there are not many people. Maybe the massive traffic jam had deter people from going? Goods are very neatly stacked with promoters ready to help and advice when needed....and also when unneeded. hehehe. Big fans everywhere thus not that hot. Haiya...since Mamarazzi is not a Public Bank Card Holder, the cashier only give this nice shopping bag when she asked for Free Gift. A man standing behind Mamarazzi also commented to the Cashier. 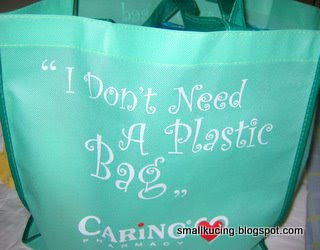 They should automatic give this bag when customer made a large purchase. Don't wait for the customer to ask for it. At least it keeps customers happy. What did Mamarazzi managed to buy? 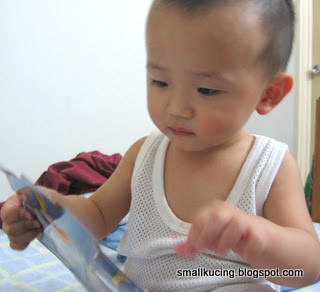 Millidon 650 at RM3/pack coz she said I am very naughty. Kept giving her headache. 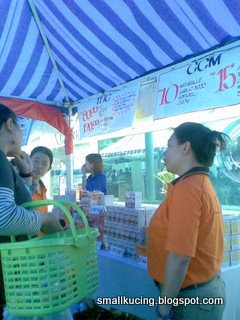 Vitamic C Chewies at RM5/bottle. But 6 get 1 bottle of Flavettles Vitamin C for free. Pharmaton at RM30. Extra Virgin Olive Oil at RM45 for Papa. Papa cooks very good Spaghetti. yum yum can't wait for Papa to start "work". 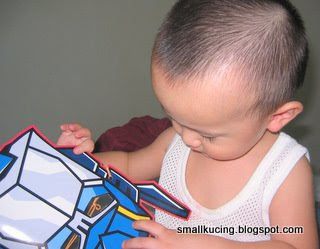 Last but not least some toys for Papa. I also get toy too. 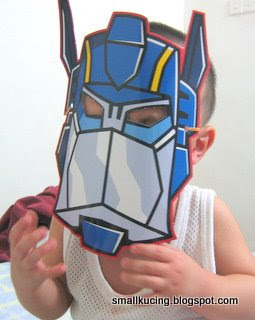 A paper mask of Transformer from the Promoter there. The Vitamin C Chewies are cheap! 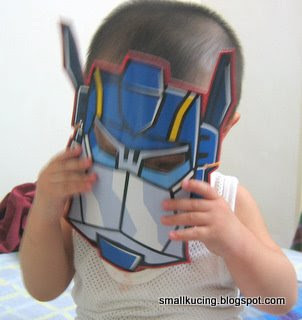 Haha...the mask is still too big for Joshua's face, cannot see the eyes! My parents-in-law went for this sale also, went there about late morning to early afternoon. They also said no Pediasure. But they went back empty-handed. 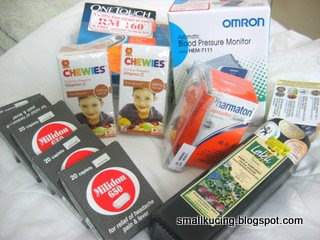 Do leave a link of your blogpost on this Caring Pharmacy sale in my warehouse sale blog, ya! I think it'll be good for future references. THanks! The Lady selling Chewies told me that it was RM18 and that day offer RM5. Bought only two bottles as previous day already bought Appleton Vit C from Guardian at RM28 for 3 bottles. Expensive. Owww...what a waste. Sometimes the advertisement didn't come in good timing. Otherwise can plan the purchases better. I wonder whether the Caring warehouse sale got sell syrup type of multivitamin supplement or not?